Last night on the ham radio net of which Ol' Backwoods is control operator, we had 20 checkins of local ham radio operators, two of which I had not heard before. I have taken to announcing the net on our ham radio club's Facebook page, just a few minutes before the net starts, so maybe word is getting out. We had 3 in our ragchew segment tonight; the rest of the checkins were "short-time" or mobile. Our discussion topics tonight included sunspots and their effect on ham radio signal propagation, and a vintage VLF radio station in Sweden that is firing up its alternator for World Radio Day. Some solar scientists are predicting that the sun may be sunspot-free in a few years, at the bottom of this solar cycle. K7RA points out in this week's Solar Update at ARRL.org, that you can still communicate worldwide with no sunspots, just not as easily. K7RA ran some predictions with W6ELprop with a theoretical zero sunspots, and found that on February 6 on a path from Michigan to Brazil would allow a twenty-five percent chance of communication on 15 meters, from 1530-2000 UTC. On 17 meters, an hour would be added on each end of that period. Twenty meters looked good, and of course 80, 40 and 30 meters looked quite promising. When he changed the date to March 22, the possibilities looked much better with zero sunspots. What suffers with zero sunspots are 10 and 12 meters, which is familiar to those of us hams who remember the 10 meter band being "dead" at the bottom of the last solar cycle. K7RA said, "But no sunspots should be fantastic for 160 meter propagation, with a smaller chance of geomagnetic disturbance disrupting communications." Just goes to show that there is an amateur radio band for almost every kind of condition that allows worldwide communication, given correct timing, plenty of transmit power, and a lot of patience. A Classic VLF Station Back On the Air Powered by... An Alternator? The Radio Station SAQ in Sweden plans to fire up its Alexanderson alternator on 17.2 kHz on the occasion of UNESCO World Radio Day, Friday, February 13. The station will begin tuning at 1430 UTC [8:30 AM Central Standard Time], and a message will be transmitted at 1500 UTC [9 AM CST]. 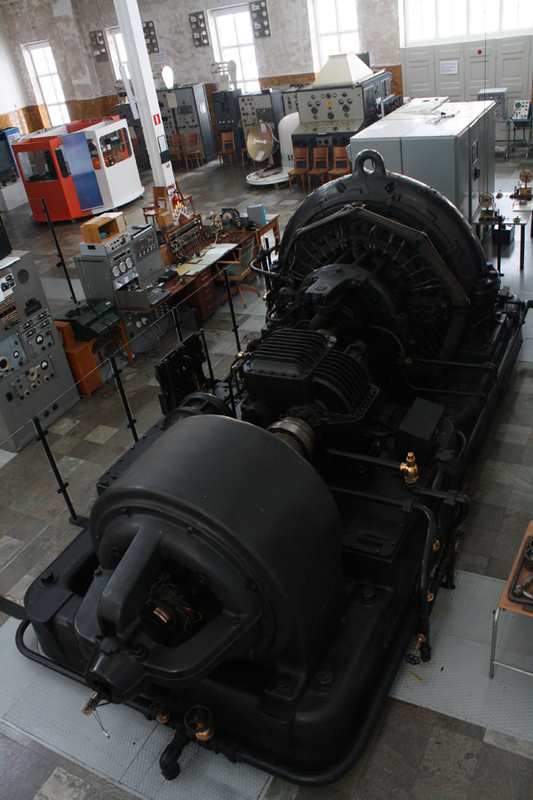 The vintage SAQ Alexanderson alternator, dating from the 1920s, is essentially an ac alternator run at extremely high speed — can put out 200 kW but typically is operated at [about 80 kW]. Once providing reliable transatlantic communication, it is now a museum piece and only put on the air on special occasions. The magnetic flux is generated by a field coil, situated outside the stator. The stator is designed to encircle the periphery of the rotor. The magnetic flux is conducted through the periphery of the rotor via the stator. The air gaps between the rotor disc and the stator are less than 1 mm wide. On the stator there are 64 armature windings that collect the variations of the magnetic flux. The variations arise when magnetic steel and non-magnetic material passes through the magnetic flux. Each armature winding gives 100 V and 30 A, which is conducted to the output transformers. An interesting detail on the high frequency generator is the device that keeps the rotor disc centered in the middle of the stator, independent of the changes of length of the rotor shaft as a result of varying temperature. Six 400+ foot towers with 150 foot crossarms support a multi-wire antenna for SAQ. The actual signal radiates from a vertical wire, one from each tower. On the Net tonight, we discussed whether it might be possible to receive the 17.2 kHz station using a very long wire and a sound card and computer. There were some skeptics, but, yes, it has been done before! My high-quality sound card, a USB unit separate from the computer, claims a high-end 3dB cutoff frequency of 20 kHz. That should be high enough to receive the station SAQ. 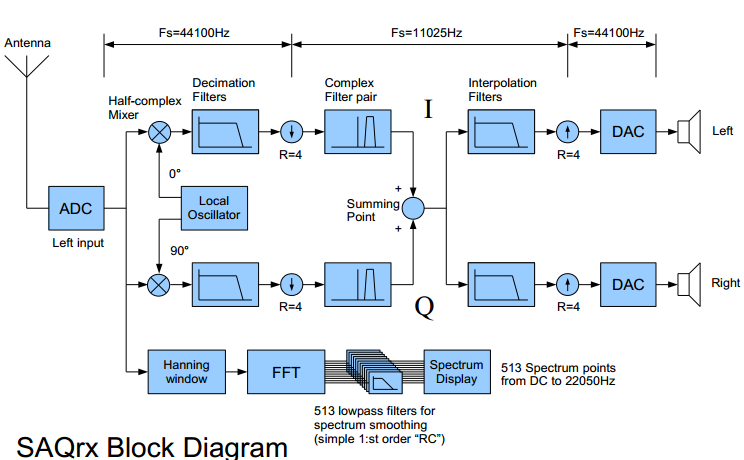 If I could record the "RF" using the sound card, I could use a sound-processing program to mix the 17.2 kHz "RF" with a 16.2 kHz synthetic tone (a "local oscillator"), producing a 1-kHz tone for the CW, that I could then bandpass filter. This would allow me to hear the Morse code when the recording was played back to my computer speakers. I downloaded the program, and ran SAQrx.exe, which is actually in the subdirectory "SM6LKM_JohanBodin". The program had no problem at all with my sound card, and I could increase the noise level by touching the center conductor of the audio cable to my MIC input. Since a half-wave dipole on 17.2 kHz would be around 8.7 km long-- no chance of that in the back yard! -- I might have a better chance with an active antenna. I'm definitely going to have to have the antenna and its amplifier outside, though, and bring in the amplified signal on a coax cable. According to this website, a ham in Ohio has received SAQ with a 100-meter-long Zepp (end-fed) antenna at 22 feet; don't think I could manage something that big, but I bet a piece of wire or metal sheet oriented vertically, and a simple RF amp might work. The SAQrx program has the ability to start recording after a pre-determined delay, and record for a specified time. So, I can start it Friday morning before I go to work, then check the recording at lunchtime to see if I received the alternator at station SAQ! There are several military transmitters in the SAQrx passband, so I should be able to see ahead of time if my active antenna is going to work. UPDATE 2/13/15 well, I didn't to do it, but another ham did!